No prayer request is too big or too small. Some people request prayer when they’ve lost a loved one; others ask for prayer when they’ve misplaced their keys! Even if you are not sure what to pray for, our prayer team will pray with you about your situation. 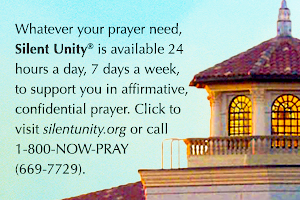 We will pray for your request for one week, then send it to Silent Unity where it will be prayed for 24 hours a day for 30 days. If you request we contact you, one of our Prayer Chaplains will get back to you within 48 hours. Blessings from our Prayer Team.